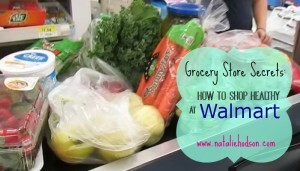 Here is a glimpse into how we make a healthy grocery store trip to Walmart while staying within our monthly grocery budget for our family of four. I’m still pretty new to vlogging and editing videos, so bear with me while I get the hang of editing, smooth transitions, voiceovers, etc. First and foremost, thank you! Thank you for being so real and showing that to eat healthy you don’t have to ONLY shop at a trendy, expensive health food store. My question(s) for you is, what advice/tips would you give someone (me! Haha!) who would like to start making “clean eating” part of their lifestyle? When you started did you throw out all the food you had in your house and re-stock your fridge and pantry with only clean foods? Thanks again for being so honest and real. You do a great job and are an inspiration! I have been trying to have a healthy lifestyle for a year. I’m having a hard time bringing my family on board. Any recommendations? I have 3 teenagers , a 10 year old, and of course my husband. Thank you for the inside look. My husband and I have had a hard time incorporating clean eating. I appreciate the time you’ve spent on making this video. Thank you for inspiring us to get back on the horse and eat healthier. Hey girl! I am SOOO happy I came across your Facebook and website page! This video just warmed by heart so much because you can just tell how REAL you are. You are living an everyday “normal” life as a Mommy and wife like many of us are as well, so you are a great example that living healthy CAN work : ) I love that you had them at the store with you too! My children are close to yours in age (2 1/2 and 11 months) so I feel like I really relate. Thanks for your website! that was an awesome video!! thanks so much!! It was a lot of help!! I have to do most of our grocery shopping at Walmart, too, as we have no other “good” grocery stores! !